A regular customer walks into her favorite coffee shop early on a Monday morning. As she sluggishly makes her way up to the counter, the barista, already running on four shots of espresso, smiles and says “The usual?” She yawns and nods her head, and the barista gets to work on making her coffee. In this scenario, there’s a good chance that the barista has remembered a handful of his frequent customers’ drink orders. These small memorizations help boost the productivity of the employee and the efficiency of the coffee shop and can also increase overall customer satisfaction. However, if you are running a larger company, you can’t put all of your customer information and insights into the hands of a caffeine-buzzed barista. There’s a mountain of customer and potential client information to keep track of, each with a varying combination of preferences for your products and services. Since the early 1990s, businesses have turned to customer relationship management software, or CRM, as a hub for all customer data. These robust systems make simple work of maintaining an array of business information such as contact information, lead tracking, customer support, employee actions, and resource management. 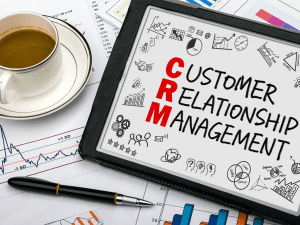 Essentially, CRM solutions are a one-stop shop for all of a business’s needs. Another great benefit of CRM systems is their ability to be highly integrative to other software and application programming interfaces, or APIs. Components such as email, spreadsheets, and even website live chat can be bundled into your CRM to give you a 360-degree view of your business. For the purpose of this article, we’ll focus on the benefits of leveraging live chat into your CRM operations. A 2015 study examined the efficacy of CRM practices on customer retention, concluding that companies with a strong CRM strategy are more likely to have (1) a greater market share, (2) increased overall productivity, and (3) higher employee morale. Keep a hand on the heartbeat of customer interactions. Your CRM solution is the hub of the interactions with your customers. It serves as the center for all customer contact information, history of interactions, sales processes, and marketing efforts. Simply put, CRM affords you the highest visibility into every touchpoint of your customer interactions. If you also employ a live chat on your business’s website, you can take your understanding of customer interactions to the next level. By integrating live chat with your CRM solution, any customer interaction that takes place on live chat can be automatically inputted into the system. This saves you time and money on manual processes and allows for a near-instantaneous understanding of your customer. Your CRM solution is a collaborative workplace where sales and marketing can act in tandem to produce the best results possible. And it is this coexistence between the two departments that help score, qualify, and convert leads efficiently. Whether you are running a marketing promotion, email campaign, or live chat on your website, the marketing team is often on the front lines of determining the chances of a conversion. Once a lead is scored and qualified, it can automatically be transcribed into the CRM service. Sales can then see how likely a lead is to convert, and marketing can go back and see the effectiveness of their marketing strategies. Build a database of insights. Combining the above two benefits, you can begin to develop an incredible knowledge base of your customers and clients. By listening to information that comes in through customer calls, emails, and live chat, you can begin to develop customer trends and analytics to drive better business decisions. It is a universally known fact in business that it’s 10 times more cost-effective to retain an existing customer than it is to bring on a new one. While it’s cheaper, it also requires a deeper understanding and a precise nurture strategy to accomplish this. A CRM solution is perhaps your most powerful tool in ensuring that you are keeping your existing customers happy. And when you combine the insights of CRM with the service of live chat functionality, you are fortifying your ability to retain and strengthen your ties with those who have already done business with you. Use insights to upsell, cross-sell, and promote. CRM solutions help you gain a more intimate knowledge of the relationship between a customer and your brand. If you are able to demonstrate this intimacy to a customer, they are more likely to trust your company and continue business with you. No matter the level of investment they’ve made, your existing customers are already familiar with your baseline integrity and quality of your brand. That makes the going easier when the opportunity comes to upsell or cross-sell to those customers. Your CRM allows you complete visibility into a customer’s interaction with your company so you can best tailor your offerings to their preferences or needs. Provide exceptional service and support to existing customers. When it comes to customer service and support, expediently gaining accurate data is crucial to customer retention. If somebody finds even a modicum of inconvenience in problem resolution or support, it could be grounds for them to jump ship and go to a competitor. However, CRM software will help you ensure a streamlined and effective customer support strategy. Automated data entry for each case increases the accuracy of information, and real-time data sharing will bring resolution to customer issues fast. Coupled with live chat, a CRM will allow you to significantly cut down on time spent per case, saving you money in the long run. It can even help improve agent experience and adoption, which in turn will provide the customer with a more pleasant interaction with your agents. No matter the size of your company, customer data is a complex and diverse landscape that, without the right tools, is a daunting task to sort through. However, it also holds some of the most valuable insights for driving revenue and maintaining good relationships with your customers. A customer relationship management solution is the most sure-fire way to get the most out of customer data.